Hello, I have had requests for more classes! Returning tanglers wishing to repeat a class are welcome. Class fee of $25 will apply, tiles included, please bring your Zentangle supplies. The first framing design in this series is very dramatic. The off the self, open stock, 11”x14” frame with an enamel finish and vine and leaf detail reflects the background of the artwork. This bold design continues with hand wrapped double mats both covered with the same neutral colour suede fabric. Corner detail on the top mat with an extra wide border on the bottom mat enhance the whimsical feel of the art, and gives the work a luxurious feeling. Cost to frame: $240 tax incl. -Open stock frames can be more cost effective compared to custom cut frames of the same/similar moulding. -Budgeting on the frame moulding allows you to spend more on details such as the 2 Hand wrapped fabric mats with corner details. -Mounting & Backing using quality materials that help preserve the life of your artwork. -Conservation Clear Glass protects against harmful UV rays keeping the colours vibrant and true to the artist’s intent. “How much will it cost to frame my picture”? This is the most frequent question asked by customers and the most difficult to answer. I could take the same work of art and frame it for $50 or $550. Over the next year I will frame the same piece of art in 12 different styles with 12 different price points. 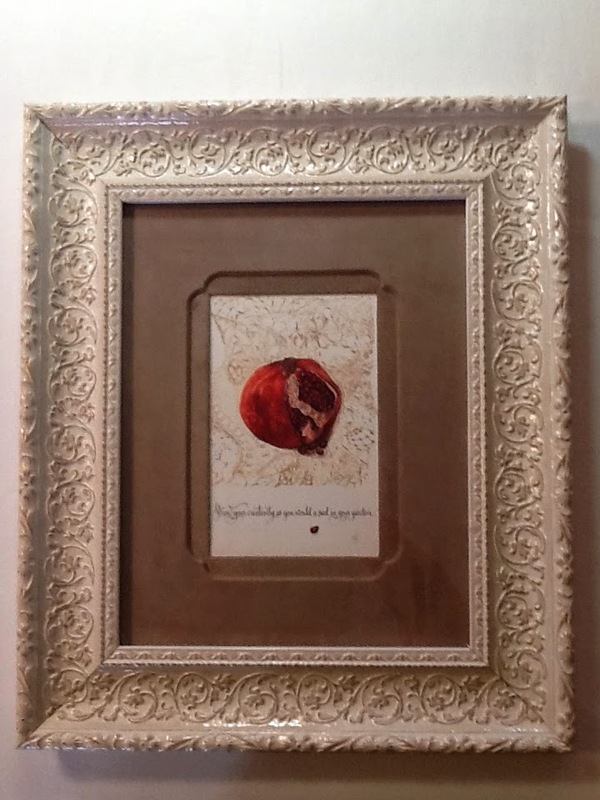 For this project I have selected a beautiful postcard of a Pomegranate with the inspiring sentiment, “Grow your creativity as you would a seed in your garden.” Original artwork by Rick Roberts & Maria Thomas. The hand carved detail around the "Green Man" adds to the whimsical nature of this picture. Triple suede mats and a filet accent this beautiful canvas work embroidery by Textured Treasures. This unique piece has hand-carved mats accented with painted details. Kimat Designs has been serving our valued customers since 1998. We only use quality materials and offer full conservation framing.